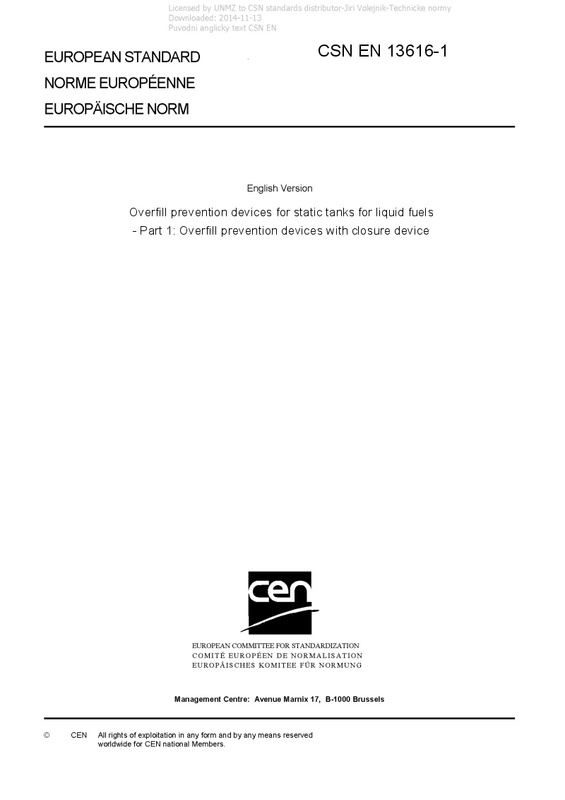 EN 13616-1 Overfill prevention devices for static tanks for liquid fuels - Part 1: Overfill prevention devices with closure device - This European Standard contains requirements, test and assessment methods, marking, labelling and packaging applicable to overfill prevention devices with closure device. The devices are usually composed by - sensor, - evaluation device, - closure device. Overfill prevention devices intended to be used in/with underground and/or above ground, non-pressurized, static tanks designed for liquid fuels. NOTE Liquid fuel means liquids for internal combustion engines, heating/cooling boilers and generators.